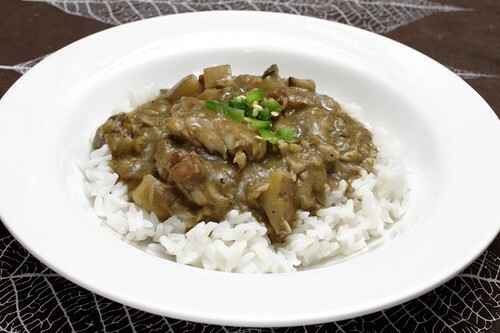 file gumbo-style tilapia stew with linguica and potato, originally uploaded by aarn! +16th July, 2010+. started a roux with one stick of butter (8T.) and 8T. of all-purpose flour in a 10-in cast iron skillet. cooked the roux ingredients over medium heat, stirring regularly, until dark and nutty, then mixed in 2.5T. of file powder (ground sassafras leaves). sauteed 1/2-lb of diced linguica in 2T. butter in a medium sized sauce pan until browned and all of the fat was rendered out. added a diced half of a green pepper, one diced onion, two stalks of diced celery, and two bay leaves to the sauce pan. seasoned the trilogy with 1/4c. of diced smoked pork fat (just happened to have this in the freezer), 2 sprigs worth of fresh chopped thyme, 2 sprigs worth of fresh chopped oregano, a heavy sprinkling of tony chachere's creole seasoning, a pinch of cayenne, 2 finely chopped dried tobasco peppers, 2T. of chopped jalapeño pepper, 1T. mustard powder, 1t. dried chervil, 1/2t. cumin powder, and salt and pepper. mixed in one large russet potato, diced. let the mixture sit on medium heat until the roux was done. slowly incorporated the contents of the sauce pan into the roux in the skillet, and added 1/4c. of white wine to loosen things up a bit. added 3c. water to the skillet with 1T. of champagne vinegar and a squirt of worcestershire sauce. placed 1-lb of skinned tilapia fillets into the skillet after the potatos were almost fork tender. simmered the mixture until the tilapia was fully cooked. reseasoned to taste and then plated the stew over some boiled white rice.